Samsung’s new Galaxy S6 flagship smartphones have powerful processors, very high resolution screens and a new metal and glass design – but sacrifices have been made in pursuit of premium materials and a curved screen in Samsung’s war with Apple. The Galaxy S6 Edge has a gently curved screen on the left and right sides. 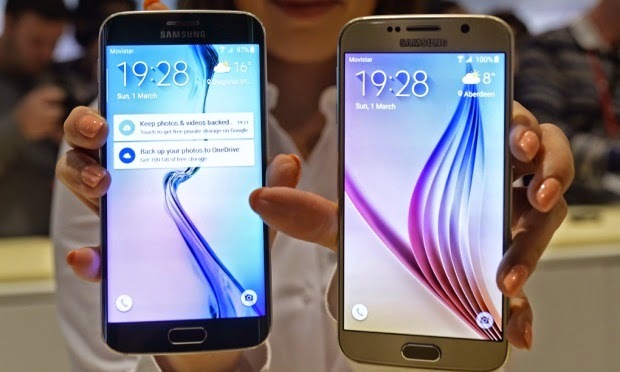 Samsung has not one, but two Galaxy S6 models – one with a standard, flat screen similar to most other phones and the Galaxy S6 Edge with a screen that curves around both left and right-hand edges of the phone. Curved or not, the Galaxy S6 has one of the most pixel-dense screens available. The 5.1in screen has a quad HD resolution with a density of 577 pixels per inch (ppi), making it denser than the 432ppi Galaxy S5, 401ppi Apple iPhone 6 Plus– and 43 more pixels per inch than the 534ppi 5.5in LG G3. The denser the screen the sharper the image, up to a point. Whether users will be able to see the difference is unknown, although quad HD is quickly becoming the new standard for smartphone and tablet screens. As with the Note 4 Edge, the curved screen on the S6 Edge adds a few features that slide out from the side of the phone. These include ticker-tape news alerts, a clock along the edge at night and a feature that places contact photos along the edge for quick access and to recognise who’s calling. Out is Samsung’s trademark, yet criticised, chromed plastic construction – the S6 is an all-metal and glass affair. A curved metal band surrounds the edges of the phone holding together a glass front and back. Thinner than an iPhone 6, by 0.1mm. The S6 and S Edge are 6.8mm thick, which is 0.1mm thinner than Apple’s iPhone 6, although both are roundly trounced to the thinnest smartphone crown by the Oppo R5, which is just 4.85mm thick. To achieve that thickness and premium design, the S6 has lost a few features. A microSD card for adding additional storage, waterproofing and a removable battery are all missing, which was a cornerstone of Samsung’s previous Android smartphones. With no external storage support, Samsung has adopted Google and Apple’s model of fixed storage variants – users will have a choice of buying a 32, 64 or 128GB version. The S6 uses Samsung’s own Octa-core 64-bit Exynos processor. Previous Samsung smartphones have used Qualcomm’s Snapdragon processors, although Exynos variants have been available in some countries. The S6 Edge on a wireless charging plate. Samsung has pledged to force wireless charging into the mainstream, and the S6 is the first smartphone from the company to have it built-in. It will work with any wireless charging pad currently available, which is good, because there isn’t one included in the box. Samsung’s improved fingerprint sensor takes a leaf out of Apple’s book, requiring only a single touch rather than swipe across (as was standard with previous Samsung models), which should make it more accurate and easier to use. 11. Another step towards a world without credit cards? Credit cards are dead, if technology firms are to be believed. Samsung has launched “Samsung Pay”, which allows users to pay for goods and services using a credit card swipe terminal, joining Apple Pay, Google Wallet, PayPal, mobile phone carriers and others attempting to be the new vector for paying for things. Samsung Gear VR will come in a smaller version for the Galaxy S6. The Gear VR – Samsung’s virtual reality headset that was made in partnership with Facebook’s Oculus Rift for use with a Galaxy Note 4 – will have a smaller version for the Galaxy S6. Samsung proclaimed that it has cut back on unnecessary bloat and feature overload by 40%, but that doesn’t include Intel’s McAfee security software and Microsoft’s apps, including Skype, OneDrive and OneNote, which now come pre-installed on the S6.